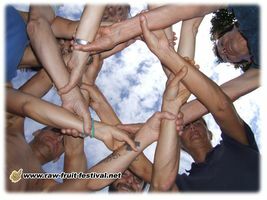 When will the next Raw Fruit Festival be held in Andalusia? The Festival will be held at the beginning of September, from Sunday, September 1st to Saturday, September the 7th, 2019. 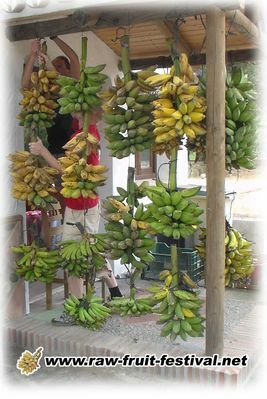 At that time of year, the weather is very nice and the local fruits are great. 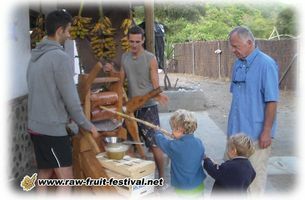 The festival organizers, Stéphane and Claire, are farming in the region, so you can be sure to find the best local fruits at the Festival, harvested ripe, directly from the producers (often friends of the organizers), and even vegetables directly from their own farm. You might discover some new varieties as well. And of course, lettuces freshly picked from the garden, mixed greens, heirloom and colorful tomatoes, mexican tomatillos, tamarillos, cucumbers, fresh sweet corn, etc etc. On a practical note, fruits will be available for breakfast, lunch and snacks, and in the evening we will offer you avocados with vegetables (tomatoes, cucumbers, etc.) and greens from nearby farms. September is the end of the avocado season, so it is quite hard to find good quality avocados at that time of the year. But thanks to Claire and Stéphane and their friends, some rare varieties of avocados will be at the festival, with some having spent 16 to 18 months on the tree!, but in limited quantities. 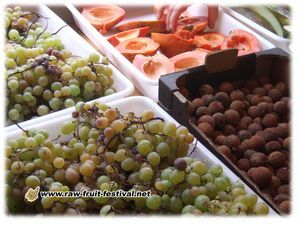 Of course, we will have fresh nuts, almonds to grab directly from nearby farms! Fruit will be unlimited, and buffet open all day long. For example, melons will always be available. Figs will also be unlimited. As figs tend to loose their flavor fast after harvesting, it is better to eat them right away. So Glorio will be picking and bringing fresh figs every other day!